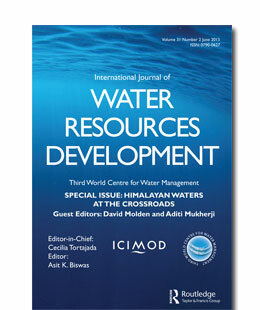 A special issue of the International Journal of Water Resources Development was devoted in 2015 to sharing the research of ICIMOD experts on a range of Himalayan water-related challenges from the status of glaciers to socioeconomic and policy aspects of water management. ICIMOD was approached by the journal to compile and edit the special issue, “Himalayan Water at the Crossroads: Issues and Challenges,” which was externally peer reviewed and featured eight articles by ICIMOD researchers and partners. Topics include an overview of changes in glaciers between 1980 and 2010, a report on risk assessment for glacial lake outburst floods, and a review of the impact of climate change on the Indus, Ganges, and Brahmaputra river basins. The issue was launched at the Fifteenth World Water Conference of the International Water Resources Association (IWRA), held in Edinburgh, Scotland, and made open access online at ICIMOD’s request to increase accessibility to researchers and stakeholders dealing with these issues in the Himalayas and around the world.